I am truly fortunate to live in a city where I can get any type of food or fresh produce at any time of year. Want strawberries in January? You got it. Mangos in November? You betcha. But just because they are available all year round, it doesn’t mean that you should buy them. Seasonal eating is an excellent way to approach your food choices. Here are 4 reasons why it is better to eat produce that is in season in your area. 1. It is cheaper. If something is in season locally, that probably means there is plenty of it around. This usually translates into lower costs. Plus, there is no additional cost of flying it from Azerbaijan to get it to your kitchen. 2. It tastes better. Food bought out of season is either grown in a greenhouse, or shipped from another country. In both cases, the flavor of the produce is likely to be negatively affected. Locally grown produce is picked at the peak of its ripeness and delivered to your farmers’ market or grocery store very soon thereafter. This leads to tastier fruits and vegetables (and fewer nutrient losses). 3. You will probably eat a greater variety of produce. If you eat your very favorite fruits and vegetables all year round, regardless of the season, you are likely to stick to the same few items. However, if you eat seasonally, you are more likely to try new things, or at the very least, you will have to eat a different selection each season. As a result, you will be exposed to a wider variety of phytonutrients, leading to greater health benefits. 4. The environment will thank you. Local produce requires less transportation, fewer plane journeys, and shorter truck rides, all resulting in less gas pollution being pumped into the air. So eating seasonally really is a win win situation. 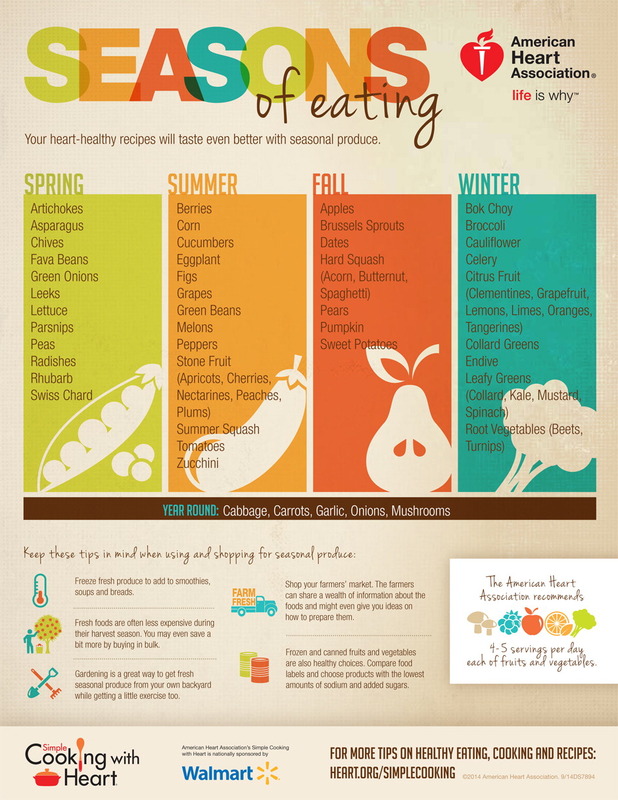 And if you are not sure what produce is in season, here is a great reminder from the American Heart Association. « Is Brown Really Better?